Need advice about a specific Nissan Murano problem? Chart based on 43 repairs. See TSBs and recalls for the 2015 Nissan Murano. Chart based on 29 repair trips. The repair cost chart excludes repairs made under warranty, do-it-yourself repairs, and repair trips that include maintenance. 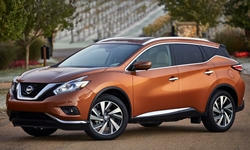 See repairs for all Nissan Murano model years. Jan 2016 Replaced defective sun visors due to discoloration from factory. Fixed door panels that were scratched when car was delivered. Fixed leather on rear headrest that was discolored. 1000 mi wind noise from moon roof and rear hatch. adjusted moon roof glass. replaced leaking rear hatch fluid lifters. C $325 part required for heating of passenger seat that emitted loud rattling noise when turned on. Also on prior repair visit the ECM was updated due to remedy console lights not turning on when headlamps switched on. This did not rectify and is ongoing . Dvd player in headrest stopped working requires new screen. 22320 mi Dvd headrest screen needed replacing . No known reason only used a few times . US $85 Vibrates when in low gear. Problem not yet resolved. Dealer needed to check with Nissan. They want us to return vehicle and they will keep it for 2 days. I believe they will replace the CVT. 9000 mi Intermittent problem diagnosed as wires shorting in the visor caused radio and Nav to not work and fuses to blow. 29000 mi The rear hatch failed to operate. The dealer service department reset the Back door Control Module, which restored it to service. About a week later the hatch quit again. The dealer ordered a new latch and installed it. 15107 mi Lost Bluetooth connection from Head Unit, Head unit was replaced with New Unit as per Service Advisor Rare case as per Nissan, but was replaced due to Warranty. also lift gate assemble was replaced due to weak struts; liftgate won't rise when prompted. 6200 mi TRANSMISSION DOES NOT WORK. (BROKEN) Symptoms: judder, jerks heavily in traffic, clunking metal sound, code P17F0. After waiting 20 days for a part they decided to replace the whole transmission. 7000 mi BROKEN TRANSMISSION (CONTROL ARM) AS PER THE TECH GUY. Second time. 7000 mi Could not get a response on why the transmission broke again and why it was in the shop for 45 days. Said I was getting a lawyer. Nissan gave me a complete refund. On the way to turn it in acted up a third time. 20000 mi Car shudders at about 20 mph. Software was updated. Did not fix the problem. 35340 mi Repair sunroof not closing and opening properly. They had to reprogram the module. Working fine now. 6000 mi Small oil leak noticed after a trip for routine maintenance. They replaced a faulty washer & cap to resolve the problem. 7440 mi Horn: Right side low-tone not working. Replaced on warranty. 20000 mi Sunroof does not work. Repair attempted but failed. Navigation/GPS has not ever been updated for this new body style Murano 2015-. The system is woefully behind and cannot be used for navigation. We must ensure we have our phones with us when we drive. 3720 mi Recall. Passenger seat computer setting was faulty. Computer setting was recalibrated. 7000 mi Passenger side fog lamp was mis-aligned and pointing up instead of onto the roadway. Driver door striker was mis-aligned causing door to not latch smoothly. 15000 mi Driver side window struggled to raise. Sometimes will go up halfway then automatically come back down. 1000 mi My Vehicle was part of nationwide recall, replacement was not done prior to delivery. Part started to fail and I had warning lights and ABS system was not functional. C $30 Battery posts replaced. Severely corroded. Cause improper battery ventilation. The posts weren't covered by the warranty, but the dealer didn't charge me for labor. See our lemon odds and nada odds page to see vehicles with no repairs or vehicles with more than three repairs. To see how frequently 2015 Nissan Murano problems occur, check out our car reliability stats.